Slice the peppers into slabs and place on foil under broiler until completely charred. Set aside to cool. Strip off blackened skin. While peppers cook, toast the walnuts on the stove top until fragrant. Let cool. Process the walnuts in food processor until well ground. Add all the rest of the ingredients and process in bursts until mixture has the texture you want. Cover with plastic wrap and cool in fridge for at least 30 minutes. 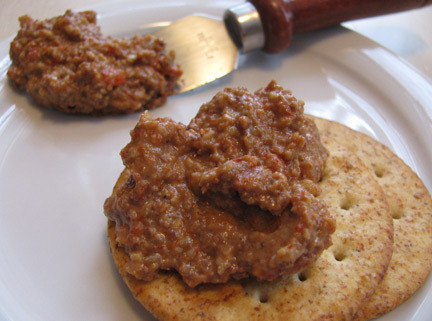 Serve with pita or other chips, or whole wheat crackers.